In depth analysis of population growth in specific geographic areas allowed The Innova Group to best locate and define the scope of the new facility to optimize its market viability. When Catholic Healthcare West (now Dignity Health) sought the best way to serve the suburbs surrounding Phoenix, Arizona, the organization turned to The Innova Group for expert analysis of the region’s geography and demographics. 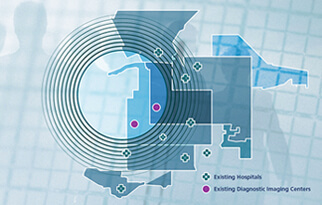 In a dynamic marketplace of existing and emerging competition, Innova’s analytical team was charged with defining the most advantageous strategy for introducing a new hospital into the area. Innova’s inquiry process involved collecting data regarding population distribution and growth trends, modeling competition scenarios, and projecting demand to best match the new facility with the future needs of the community. The final product was a development plan that defined the target location, along with primary and secondary service areas, optimized the operational performance and facility requirements, forecast both cost and revenue streams, and plotted staff growth over time. The resulting inpatient and outpatient facility has closely followed Innova’s initial projections since it opened in 2006. Building on Innova’s success, Dignity has teamed with The Innova Group to produce similar studies for facilities in Arizona, California, and Nevada.